Why would I need self storage in Port Saint Lucie, FL? There are a variety of reasons why you might need self-storage in Port Saint Lucie, FL. How much is a storage unit in Port Saint Lucie, FL? The cheapest storage unit in Port Saint Lucie, FL is $28.00 per month. What size storage units do you have available in Port Saint Lucie, FL? In Port Saint Lucie, FL we have sizes that range from 5'x5' to 10'x20' to suit your storage needs. How much is it for a 5'x5' storage unit in Port Saint Lucie, FL? The cheapest 5'x5' storage unit in Port Saint Lucie, FL is $28.00 per month. Midway between Miami and Orlando, Port Saint Lucie is a bustling midcoast city. It's on the southern end of the Treasure Coast, which earned its name from the old shipwrecks in the area. As a relatively young city, Port Saint Lucie has a short history that began in 1958 when a developer decided to build a new community on the Saint Lucie River. The city was incorporated in 1961, and it has grown at an impressive rate ever since. Port Saint Lucie has seen an astonishing population boom in recent years, with the population more than doubling since 2000. The city attracts a diverse group of people with its pleasant weather, many amenities and healthy economy. One of the primary perks of Port Saint Lucie is its setting. While it's far from the crowds of Orlando and Miami, it takes only a few hours to drive to either of these larger cities, where recreation and entertainment are plentiful. The beach is nearby, making it easy to enjoy water sports or a walk on the scenic coast. 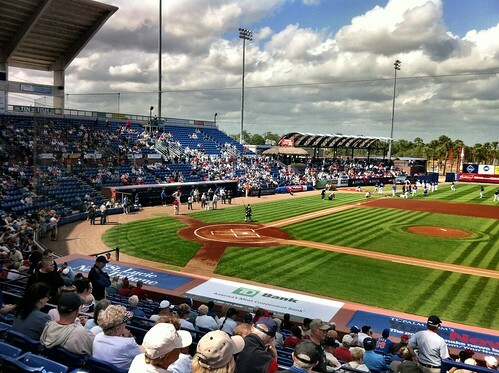 If you're a baseball fan, note that Port Saint Lucie is the spring training home of the New York Mets. Or, you can explore one of the local museums, like the SEAL Museum at Fort Pierce or St. Lucie County Historical Museum. Regular community events include the spring Eggstravaganza, Oktoberfest and an annual St. Patrick's Day celebration. Port Saint Lucie has seen strong job growth in recent times, so you'll find plenty of job options within the city. Some major employers in the area include a Walmart distribution center, QVC and Tropicana. If you can't find a nearby job, there's always the option of commuting to a nearby metropolitan area. Sandpiper Bay is located on the Saint Lucie River, and is one of the most scenic neighborhoods in the city. Here, you can explore the Saint Lucie Botanical Gardens, tee off at the Saints Golf Course or enjoy the amenities at Club Med. Thanks to its location on a 21-mile long diversion canal, Hidden Oaks is a hub for fishing and water sports. Many families are also attracted to the area for its top-rated schools, which have a central focus on incorporating technology in the classroom. If you're looking for something in the heart of the city, Canal Pointe is an excellent fit. It provides convenient access to nearly any area of Port Saint Lucie and is home to several local parks where you can enjoy the beautiful weather. Lyngate is often considered one of Port Saint Lucie's most dog-friendly communities. Here, you'll find the Lyngate Dog Park, featuring dog agility training structures, open grass areas and doggy drinking fountains. The Saint Lucie Public School District oversees the public schools in the area, ranging from elementary to high schools. There are a few private schools in Port Saint Lucie as well, most of them faith-based. If you're considering working toward your college degree, there are a few post-secondary schools you can choose from. Indian River State College, Barry University and Keiser University provide a variety of study tracks and degree programs. Utilities: Florida Power & Light (FPL) is the city's main electricity provider. The city's utilities department manages water and sewer services. Garbage and Recycling: Trash and recyclables are collected curbside, with your address determining your specific pick-up day. You can also take advantage of scheduled bulk pickup days. Transportation: Port Saint Lucie offers two separate bus services, one with several fixed routes and the other operating much like a personal taxi service. If you're considering commuting for work or school, the Park and Ride program is a convenient way to save time and gas money. There are both houses and condos available in Port Saint Lucie, but if you would prefer to rent, apartments are also an option. The median home price in the city is slightly higher than the national average but relatively affordable for a coastal town. Our lowest priced units in Port Saint Lucie, FL average $28.00 per month. 78 people have reserved units in Port Saint Lucie, FL in the past 30 days. There is 1 location within Port Saint Lucie, FL's city limits. There is 1 location in Port Saint Lucie, FL that offers AC and Heating features.